Fashion is ephemeral, while fabric and pollution are not. Once inspiration, image-making, and excitement pass, the clothes remain hidden in our wardrobe everywhere. 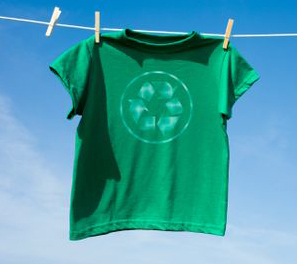 Being eco- oriented in fashion means reducing post-consumer refuse and pre-consumer waste and pollution. Before purchasing a new garment try to find out if chemicals were used to grow its components , are the dyes safe? 1.Plan before shopping. Purchasing something new means to have a place in your wardrobe. Knowing in advance what you’re looking for will save time and cut down clutter. You will use more your piece and feel great if you consider the color that work for you, what fits work the best, will that piece match with other things already in wardrobe?. If you wonder Will I wear this in two years? and answer is no, then forget about. 2.Take care of them. Whatever you have bought, take care of it. As soon as get home change your clothes. Never cook or do the cleaning with clothes you want to wear in public. Learn to sew a button and look for a tailor near your home for major repair or modifications. With your shoes check the sole and toplifts and change them before they are already overused (like this you will avoid that heel will be damaged). 3. Avoid dry cleaning. Read the tag and the composition. Some garments instruct to only wash dry hiding its poor quality. Many articles even if tagged for dry clean treatment can actually be hand washed, especially linen, wool and silk. Check if there is a local green cleaner if dry treatment is the unique way to clean your lovely piece. 4. Buy used or vintage. You will be amazed of how many cute and worthy vintage dresses you can get a cheap price. Buying vintage you will give a second life to the garment and maybe supporting a charity program. 5. Wash green. Washing uses lot of water and energy, so do it when is necessary and do a full load laundry. Always turn articles inside out and use the lowest temperature possible. Choose phosphate free and biodegradable detergents. Treat stains beforehand with non toxic removers. Actually you can find many eco-friendly detergents at reasonable price in the market. If you are thinking about changing your washing machine, look for energy saving and check out for the option programs. There are quick programs that last 30 minutes and works perfectly even if set at 30 C.
6. Think twice about new fabrics. Now eco-conscious designers are exited about new options, but it is better to think twice about the harvesting and fiber processing, are they often polluting? are regulated?. Approach these new alternatives like soy, bamboo, tencel, corn as substitute of nylon, acrylic, polyester and conventional silk while more information will be available. Remember to shop with a plan and do not fill your reusable bags just because garments are tagged “eco”. 7. Read manufacturer label. Have an eye to “Made in label” and try to find out beforehand if the company that produces clothes are under fair-wage and follows labor practices. 8. Don’t throw away. Don’t get rid of your lovely cloth to the bin. If the condition is perfect you can consider a close friend would love to have it or you can exchange it. Then finally you can donate it.